Branches of three more Russian universities, namely, Moscow State Institute of International Relations, the Higher School of Economics and the Moscow State University of Humanities and Economics will open in Azerbaijan, Russian Ambassador to Azerbaijan Mikhail Bocharnikov said at a press conference in Baku on Oct. 11. The diplomat stressed that much attention in bilateral relations between Russia and Azerbaijan is paid to education sector. "This is the most important part of our humanitarian cooperation,” he said. “During the recent meeting of the presidents of Russia and Azerbaijan in Sochi, a number of important documents was signed, including a road map dedicated to humanitarian cooperation. In particular, there are some issues concerning the expansion of inter-university cooperation." Bocharnikov stressed that today two branches of the Russian universities operate in Azerbaijan. "This is a branch of Moscow State University and I.M. Sechenov First Moscow State Medical University,” he said. “So, the task of opening branches of three more Russian universities in Azerbaijan has been also outlined in the roadmap, which was signed as part of a bigger document. Among them are Moscow State Institute of International Relations, the Higher School of Economics and the Moscow State University of Humanities and Economics." The Russian diplomat also stressed that about 15,000 students from Azerbaijan are currently studying at Russian universities. Bocharnikov stressed that Russia always attaches great importance to the Baku Humanitarian Forum. 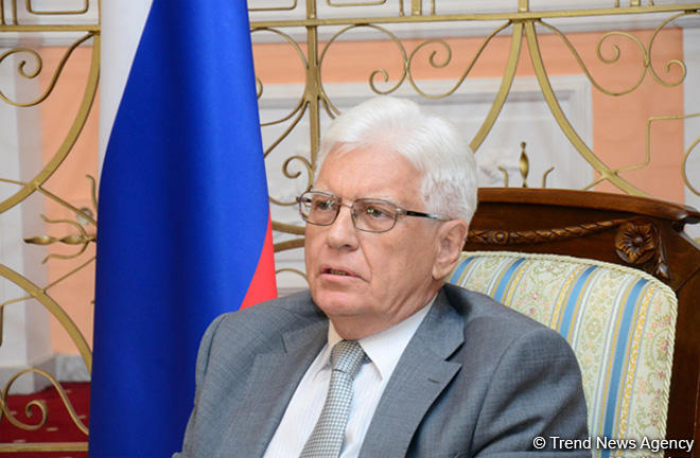 "The meetings of the presidents of Russia and Azerbaijan at the high level stimulate the development of relations in all spheres,” the diplomat said. “And the fact that four meetings took place this year is of great importance. I would say that they [the meetings] give a very significant impetus to the development of a benevolent atmosphere in our relations." “The friendly contacts established between the presidents of the two countries apply to all formats of relations between Russia and Azerbaijan,” Bocharnikov added.